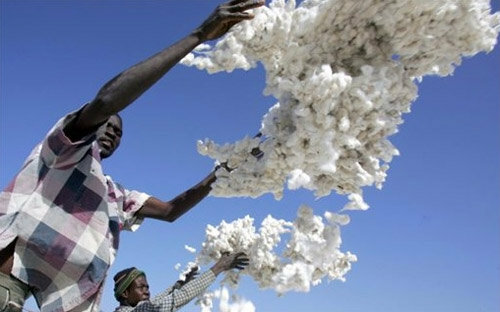 New York (AFP) – The price of cotton rose sharply last week in New York, buoyed – like the majority of raw materials - by the hopes of recovery in global economic activity, whilst American production is expected to decline again this year. In its annual report the American Department for Agriculture estimated that land cultivated for cotton in the USA would decrease this year by 7%, dropping down to 3.5 million hectares. But the market has not reacted much, in the opinion of John Flanagan of Flanagan Trading because it expects a more important downturn. “Thanks to the massive effort on the part of the central banks, primary materials have suddenly come back into fashion as protection from inflation,” noted the analysts at Plexus Cotton. Interventions by central banks in the markets, which created money to relaunch credit based markets, have stoked fears of a surge in prices. More and more investors are anticipating the regalvanisation of the economy, encouraged by recovery shown in economic statistics in the USA in the past few days. Furthermore, despite “large quantities of cotton being available throughout the world and perspectives for consumption staying relatively subdued,” American exports have remained steady, added the analysts at Plexus. At 15.50 GMT, contracts for delivery in May were valued at $0.4666 the pound compared to $0.4334 at close on Friday 3 April. The index Cotlook A, the daily average of the five lowest cotton prices at market in Asian ports, valued Friday 3 April at $54.35, up from $52.35 on Friday 27 March.